Thermal management of satellites in orbit requires careful balance of heat rejection to space via radiation with the internal and external heat loads. The thermal environment encountered by satellites varies greatly throughout the orbit which makes the thermal management extremely difficult. A conservative design is often employed in practice, which incorporates excess survival heater power and results in serious mass and volume penalty. 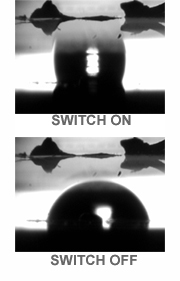 One promising technology is a thermal switch which can provide thermal control by switching between high and low heat transfer regimes around a set point.We propose and demonstrate a novel liquid-droplet-based thermal switch aimed for satellite thermal control by using coplanar electro-wetting-on-dielectric (EWOD) configuration. 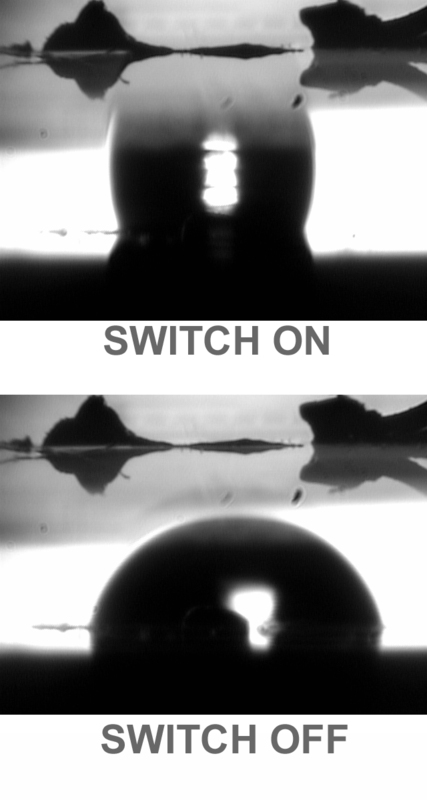 By fabricating and testing the proof-of-concept devices, we confirm the mechanism of droplet detaching and attaching for the thermal switches. Thermal tests have shown the reasonable thermal performance with water and glycerin. Further development with novel liquid with low vapor pressure and high thermal conductivity is expected to improve the performance.